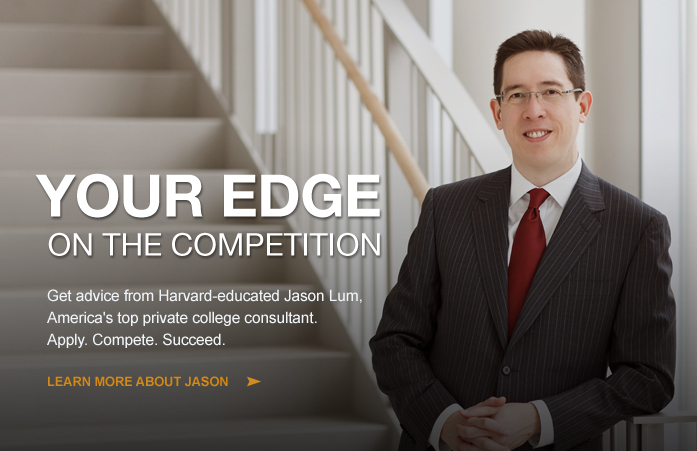 Jason Lum profiled by America's leading college counseling magazine about college admissions and scholarships. The U.S. News Best Colleges Guidebook offers comprehensive advice for high school students and their families on researching all the options and choosing the best colleges for them. USA TODAY's first-ever graduate school guide, perfect for the career-changer or propsective student. When I began applying to colleges, the whole process seemed overwhelming. Thanks to your help, I was accepted at all my top four choices- Harvard, Yale, Princeton, and Stanford- and am currently happily attending Harvard. Thanks again! We had met with a few college advisors before but once we spoke with Jason, we immediately chose him. His hard work was shown on the first visit and our relationship only improved from there. Even in my junior year, well before all other advisors would have begun the process, Jason took the time to sit down with us and create a plan of what universities I would apply to. He told us about all college options, from liberal arts colleges, to state schools, to Ivy League universities. By senior year, we were already a step ahead of others as we already had an application plan, allowing us to focus on essays. With each essay I wrote, he would meticulously go through each sentence and show where improvements could be made without taking away my voice. With his incredible work effort, I was able to get into my dream school. As a Brazilian, my initial fear was that it would be hard to work with Jason due to distance and time zone concerns. It turned out to be really easy to work on a daily basis with him! From the very first contact with Jason, I felt comfortable as I could see his professional standpoint and genuine determination of his work. He has a firm grip in assisting in the best way possible. With every essay I wrote, he was scrupulous with not only the grammar and sentence structure, but the general impact of the essay as well. His advice and suggestions showed me parts where I could improve and add more voice to my paper. In conclusion, after all this process, I’m delighted to recommend him as a college advisor.